100% cotton cap in faded blue. Hand distressed with a vintage Huntsville State Park patch. Adjustable with a brass fitting closure. One size fits most. A little history on the Vintage Huntsville State Park . . .
Huntsville was a campground well before it became a park. Permanent flowing fresh water, walnut, hickory, persimmon, water fowl, fish, shellfish, and plenty of other plants and wildlife drew Native Americans here. For them, Huntsville was a land of plenty. When Europeans first came to this area in the 1500s, this was Bidai territory. The Bidai are a mystery. Historians think they were related to the Akokisa, an Atakapa band. But they imitated the Caddo way of life in their villages. The Bidai were famers, hunters and gatherers. Occasionally, they would venture to the coast to trade. The tribe lost half its members to an epidemic in 1776-77. Most of the remaining members joined Caddo and Atakapan tribes. The last remaining Bidai left the area for a reservation on the Brazos River in 1854. After a later move to a reservation in Oklahoma, they lost their identity as a distinct cultural group. The Bidai were no more. Spaniards established the first European settlement in this area 34 miles north of the present-day park in 1774. Many more settlers followed. Although settlers owned this land in the 1800s, none lived in the present-day park. While it lacked people, it had plenty of trees. An era of intense lumbering began in Texas in the 1880s. This boom grew from a shortage of trees in the northern United States. After the railroad arrived in the area in 1871, transportation of lumber from this area to distant places became feasible. By 1905, the Walker County Lumber Company owned the 1,445 acres that would become the park. The company deeded the land to Thomas S. Foster in 1911. 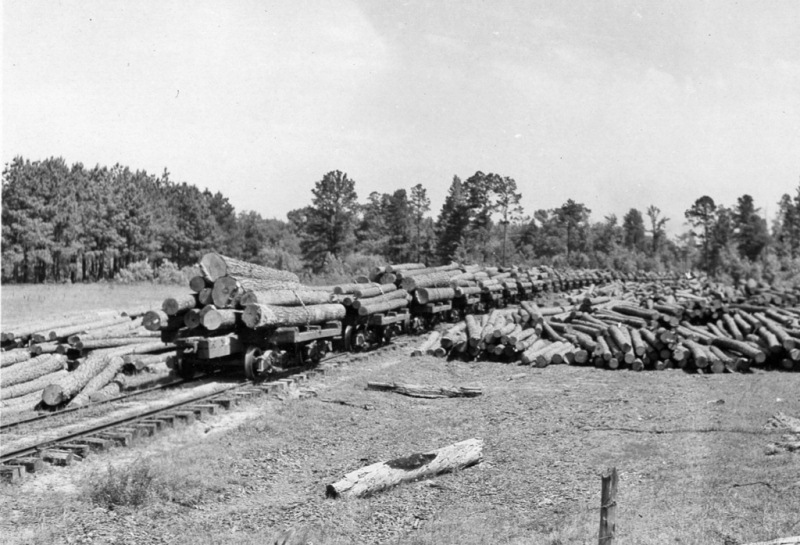 Foster’s company (the Foster Lumber Company) owned the Walker County Lumber Company. The present-day park was never clear-cut, though timber harvesting occurred here at different stages. Logging probably ended in this area before World War I. By the mid-1930s, the trees had grown back and the land was heavily wooded. In the early 1930s, local residents decided they needed a park. They chose this site because the creek could be dammed to make a lake. Walker County voters approved the sale of $20,000 in bonds to buy the land, and then donated it to the State Parks Board. Construction began in 1937. A Civilian Conservation Corps company made up of African-American veterans built the park. The men constructed the dam, the group recreation hall and the boat house. Other projects included a frame pump house, stone culverts and stone road curbing. The CCC men also helped with reforesting the park, planting pine, sweet gum, maple, oak and dogwood. 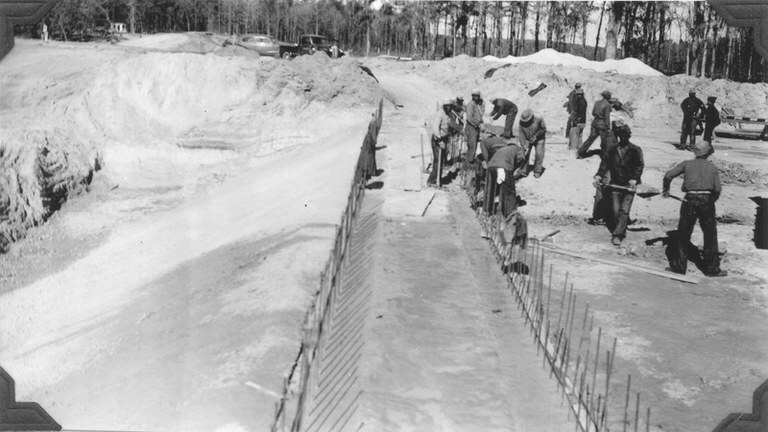 CCC men at work on the dam. With the onset of the Great Depression in the 1930s, the nation faced a terrible unemployment crisis. With more than half of the young men under 25 out of work, President Franklin Roosevelt created the CCC to provide jobs. Under the program, young men developed national and state parks, as well as rehabilitated forests and controlled soil erosion. In November 1940, 12 inches of rain fell in two days and the dam collapsed. No money was available to repair the damage. Work continued on other park projects for several more years. But in 1942, with the onset of World War II, the CCC withdrew. Works Progress Administration workers and prison laborers continued working. The park opened on a limited basis during summers of the war years. Ten years later, a new plan emerged. The Texas Forest Service would supervise cutting trees in the park and selling them to raise funds to repair the dam and finish the park. The plan worked, and the 2,083-acre park opened to the public on May 18, 1956. – “Huntsville State Park.” Texas Parks and Wildlife. N.p., 04 Aug. 2016. Web. 14 July 2017.